I think, even more so than a good movie, a good game would really bring some people into the Superman franchise. With my constant jealousness of the Batman franchise, I saw the semi-recent success of his Arkham games and wanted that for Superman. It’s worth knowing that Superman has famously never had much in the way of good games and, in fact, has some of the very worst games out there. Thus, if we finally gave him a good game, we’d not only be introducing new people to the franchise, but we’d be remedying that unfortunate state. I will point out, to begin, that I don’t think we currently have the technology to make the Superman game I’d consider ideal. If you can’t give me a non-scaled-down, fully destructible version of Metropolis with millions of distinct npc civilians, well then what’s the point? But if we can’t meet that unrealistic expectation, what do I propose? 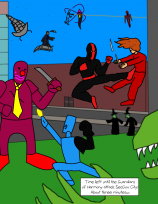 Why, we make a game starring Jimmy Olsen, of course! Jimmy can be a fighter. Not on the level of Batman, obviously, but if you give him a fighting style that focuses heavily on disarming opponents and Judo-style moves and all that, you’ve got as much to work with for a game. Throw in temporary super-power-ups like Elastic Lad and Werewolf forms, and photograph-taking missions, and you’ve got a way to introduce all the elements of the franchise to that massive gaming audience. And you don’t even have to piss anyone off by making Superman “weaker” than he’s supposed to be. 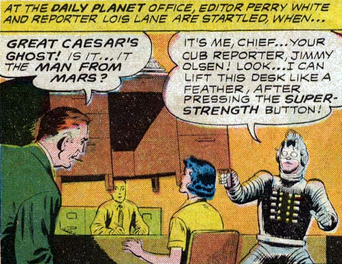 A very similar argument could be made for making a game starring Lois Lane. In fact, it’d probably be better. But I’m still nervous about how they’d mess it up. 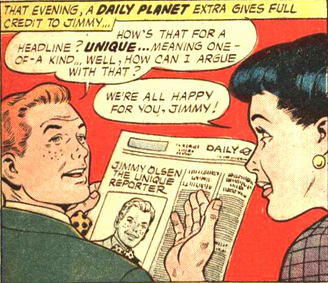 If you mess up a Jimmy Olsen game, who cares? If you mess up a Lois Lane game, that’d hurt.